It’s warm here in Southern California. It was downright hot earlier this week. When it gets warm, I start to think about salads. 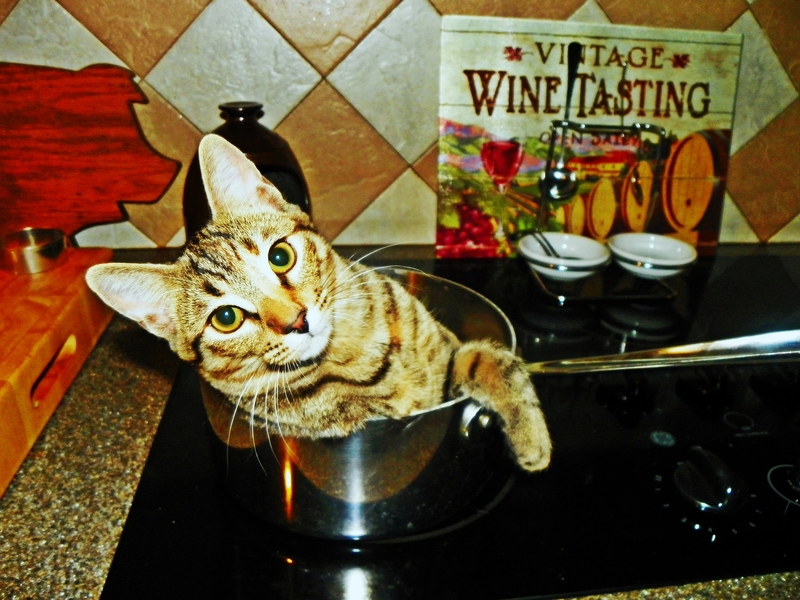 It’s just too hot to stand in front of a stove for a couple of hours. I also need something that I can make or prep ahead and pull out of the fridge when we get home. This week, we had baseball playoff games two nights and didn’t get home until nearly 8 pm. The other days, we had an orthodontist appointment, a doctor appointment and “we” are working frantically every night to finish a very important 7th grade science project. Not to mention there are quite a few cooking competition deadlines coming up–lots of “experimenting” going on in the kitchen. Needless to say, I needed to come up with a quick, light, yet healthful and satisfying dinner. Salad! But not just any old boring salad. I spent a little time putting this super-duper salad together one afternoon earlier this week. With the fresh mozzarella and roasted asparagus, it’s hearty enough to satisfy any appetite. And the peas . . . 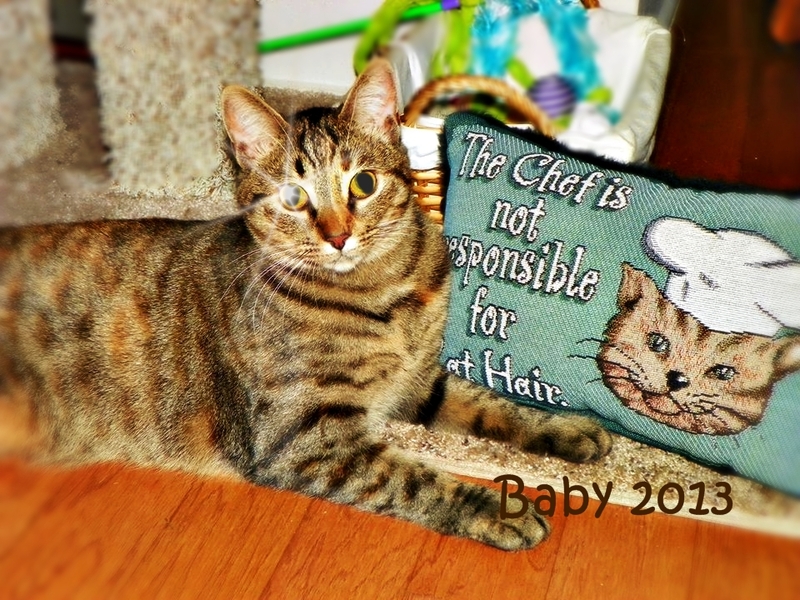 I LOVE peas! Fresh peas and sweet cherry tomatoes keep the salad light and summery and the arugula gives it a healthful dose of green. You can always use a bottled vinaigrette in a pinch, but if you have the time, make your own. It’s really worth it. Happy Salad Days to you! First make the dressing. 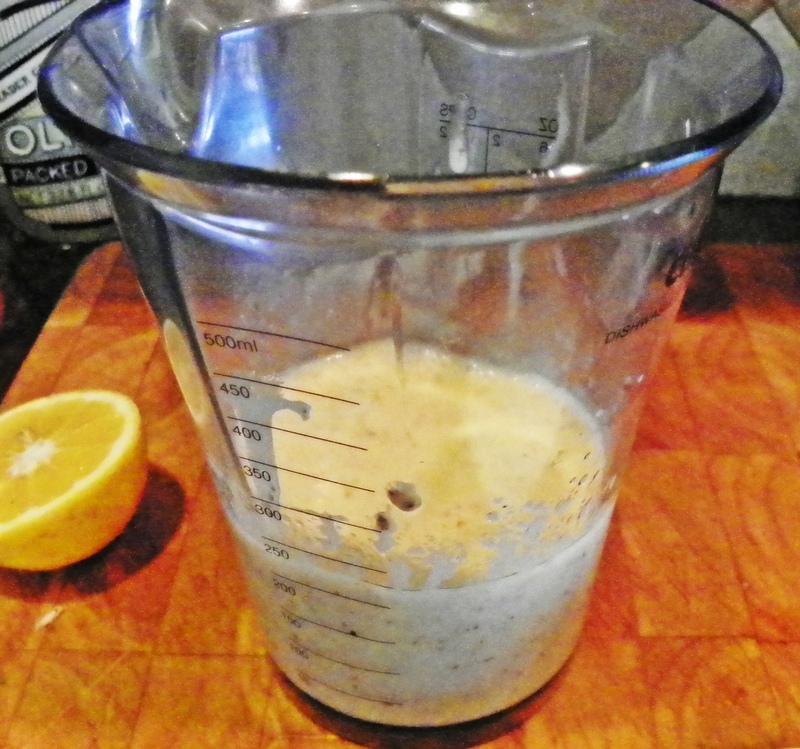 Combine all ingredients in a blender or mini food processor (or use your stick blender, like I did) and blend or pulse until emulsified. It’s not listed in the ingredients and it’s not absolutely necessary, but I like to add a squeeze of lemon juice to add a little more freshness to the dressing. Set aside. Refrigerate if you’re not using right away. Cook the pasta in salted water according to package directions until al dente. Drain, rinse with cool water and drain again. Once the pasta is well-drained and cool, transfer it to a large bowl. 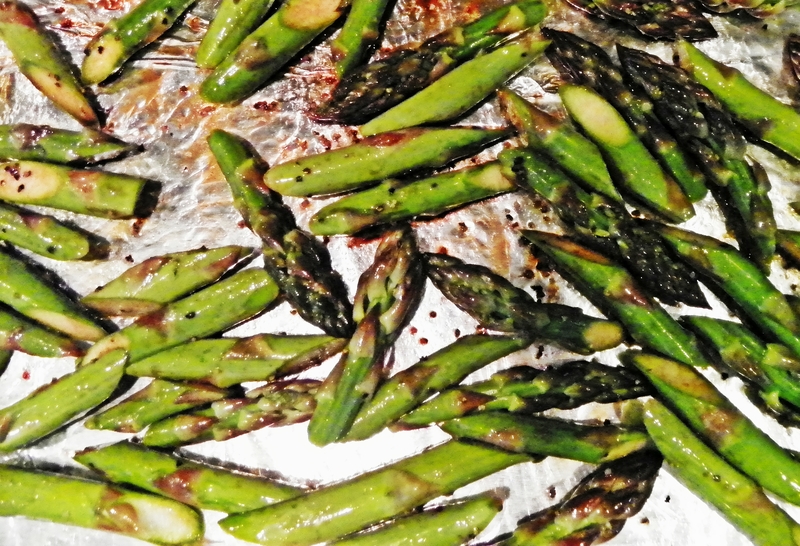 Toss the asparagus in the olive oil and balsamic vinegar and spread them out on baking sheet. Season with salt and pepper. Roast asparagus at 400 degrees F for 5-7 minutes, until cooked, but still crisp. Remove from oven and set aside to cool. 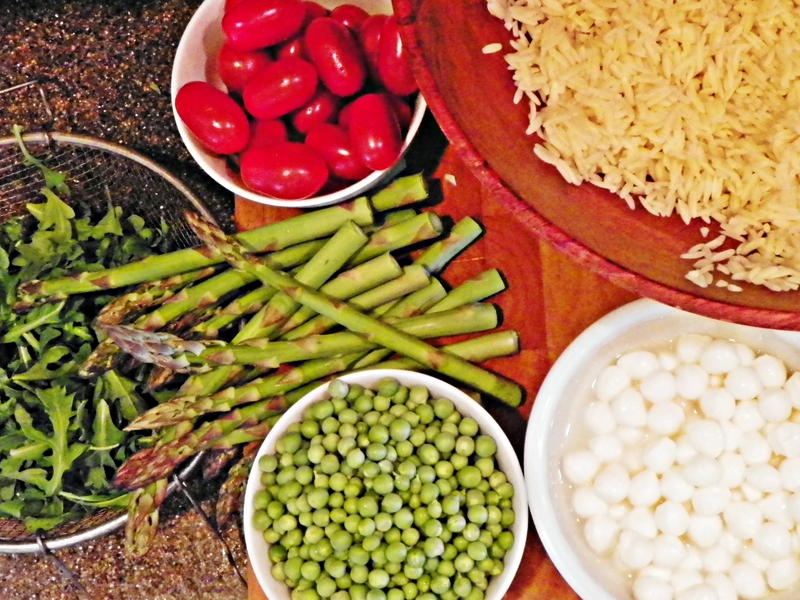 Add the tomatoes, mozzarella, blanched peas and roasted asparagus (when cool) to the bowl with the orzo and toss to combine. If you’re making the salad ahead of time, stop at this point and refrigerate until ready to eat. When you’re ready to serve the salad, add the baby arugula and about half of the dressing and toss to combine. Taste and add more of the dressing, if desired. That schedule sounds very familiar!! I love the salad! MMM roasted asparagus!! 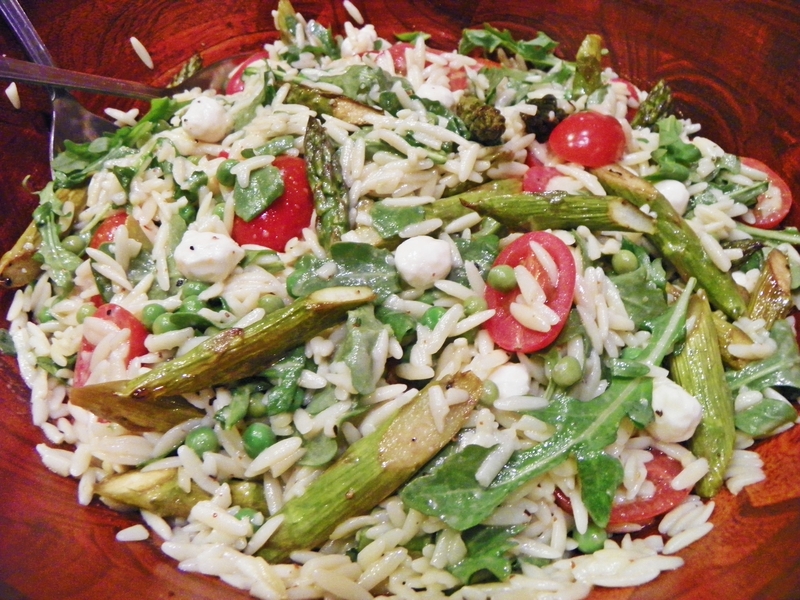 Haven’t tried in a salad – but will be perfect as even my kids now like roasted asparagus. Great recipe, Thanks!! Thanks, Tina! Gonna be a lot of salads on the blog this Summer! 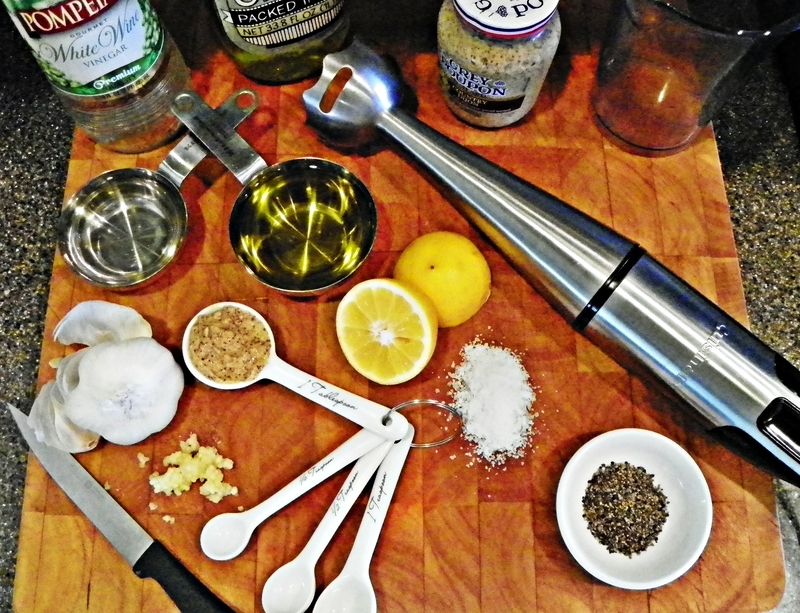 I’m going to start experimenting with some grains–LOVE the farro salad you made recently! What a lovely salad, and I’m really enjoying your presentations. Not only are they well done and beautifully photographed, but you manage to portray how much fun you’re having doing it. Good job. Thanks, Mary! I am having fun doing it, for sure! But I’ve gotta find time to get back to the contests! LOL! Hi – is there a printable version of this salad? Hey Kathy! Can you print the page? I still have to figure out how to get a print icon to work. I can email or msg it to you! !